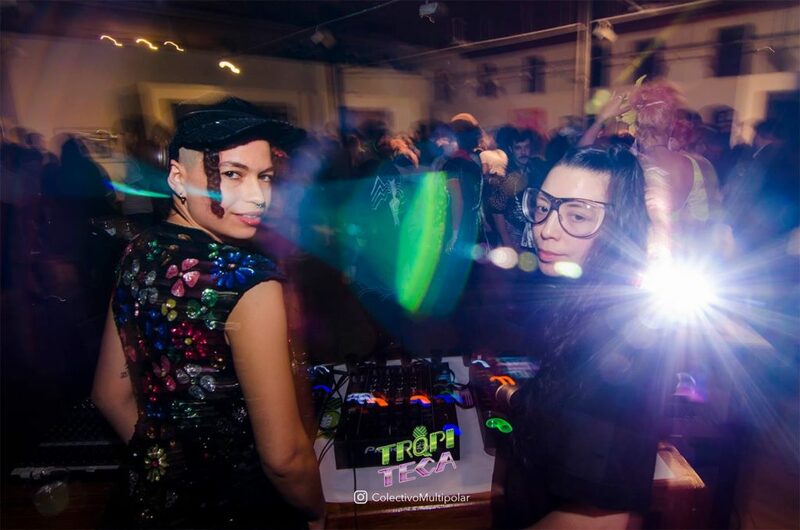 For nightlife artist/organizer duo TRQPITECA (comprised of Natalie Murillo, aka LA SPACER, and Jacquelyn Carmen Guerrero, aka CQQCIFRUIT), the weekend is more than just an escape from the work week. Under their watch, the weekend and its requisite parties represent queer possibilities for art, genderfuckery, discourse, experimentation, community-making, healing and more. All of this will come to the fore this coming weekend when they present the first ever International Chicago Underground Queer Transcendance Symposium—or ICUQTS for short (pronounced like “I see you cuties”). This two-day queer underground extravaganza will represent the queer and trans contingent of EXPO ART WEEK 2018, juxtaposing visual art, underground performance, film, nightlife and panels. M Lamar, Zemmoa, Keijaun Thomas and Ariel Zetina are on the list of performers, and the keynote will be LaFleur, Afrofuturist artist and recent Detroit mayoritorial candidate. In preview of the festivities, Scapi reached out to TRQPITECA for the backstory and a special sneak peek. So how did ICUQTS come about? How does ICUQTS further what you’ve been doing at TRQPITECA? TRQPITECA: We started TRQPITECA in 2015 as a platform for ourselves and other artists in Chicago working with queer and tropical aesthetics, to the sounds of tropical, house, and techno music. 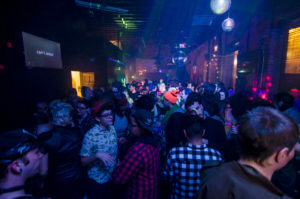 We also wanted to create nightlife event for Pilsen’s queer and artist communities because of the lack of monthly queer, underground dance parties happening in this part of Chicago, which attracted people not only living in Pilsen and the South Side, but all parts of Chicago and even people coming from outside of Chicago. The original location of TRQPITECA was Junior’s Sports Bar, which over the years had transformed from a rock-en-español kind of bar to Pilsen’s closest thing to a gay bar. It had a stage, a bunch of TVs, affordable drinks and was under queer POC management, which was very supportive of our installations, programming and crowd. We curated the stage, DJ booth, TVs and space with artwork by queer and POC artists, musicians and DJs once a month until they were shut down a week before our two year anniversary. After Junior’s shut down, our operations came to a halt. Finding a space that aligns with your goals, values and budget can be very challenging, and we did not want to rush into anything. We ended up taking some time to work on other projects, and doing pop-up TRQPITECAs when the opportunities presented themselves. The idea for ICUQTS came from a moment of wanting to take our work as TRQPITECA to a bigger level through the creation of a festival that would integrate multiple art forms into a shared space, as TRQPITECA has always done. When we saw the announcement to apply for the Propeller Fund last summer, we knew this was our opportunity to turn our dreams into reality. We came up with the acronym ICUQTS and filled in the words that would communicate our vision perfectly: International Chicago Underground Queer Transcendance Symposium, an event that would put the spotlight on artists coming out of international underground queer culture. ICUQTS gives the opportunity to showcase more artists both spatially and temporally; because it’s a two day, eight hour long event in a larger space, it gives artists more time to showcase their work physically through the exhibition and programming, but also virtually through social media and web promotion, press and media coverage, and the online archive that will live on long after the exhibition closing date. By having an open application process, we also gave space to artists outside of our social and physical circles that are working within the global queer movement, in order to cross-pollinate ideas coming from different places around queer art and culture. 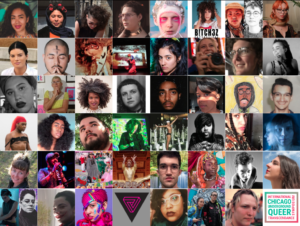 For example artists from the TRQPITECA community living outside of Chicago like Zemmoa and Keijaun Thomas will be performing alongside artists joining us for the first time like M Lamar and NAXÖ. 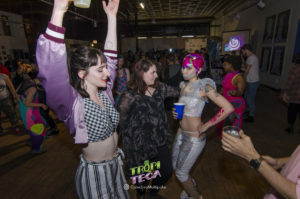 Since TRQPITECA is a nightlife event and ICUQTS is all-ages and happening during the day, it should reach a wider audience that doesn’t necessarily always go to nightlife events for a wide range of reasons. Having workshops and discussions led by artists and community organizations offers much needed moments to talk about solutions to shared issues experienced by not only queer communities, but our extended communities of allies, friends, family, neighbors and coworkers. Hopefully the work we are doing within the queer community can have a positive impact on other communities! I hope so! I’m really excited to see a symposium that takes queer nightlife seriously, as a lifeworld for queer and trans people that’s in conversation with art, music, fashion, culture and everynight life. What shifts do you think happen when you look at queer nightlife through this prism of interdisciplinary art and community’? TRQPITECA: We think it’s important to give queer nightlife its recognition as interdisciplinary art form, to and from the community. Although it may seem like the intention of queer nightlife events is just to party and have a good time (and there’s not nothing wrong with that) we are fulfilling an important need within the framework of society, specifically in terms of social and creative outlets. When the intentions of something created comes from the heart, and is not driven by the desire for profit or wealth, it becomes almost like a cultural art form. The creation of an experience that produces feelings, emotions, visceral reaction and deep thought is the essence of art. What we do is more than nightlife, it’s an experience, and the intention and energy behind the experience comes from the intersection of art and community. As artists, there are times we do not feel our work is validated because it’s not in a major institution or organization; yet art is not just in those institutions, it’s inside of us and everywhere we go. When we create the platforms to experience art ourselves, it’s like creating a portal with the power to transcend time and space into another dimension. We are redefining art and ourselves at the same time. Queer and POC centered nightlife is often described as a utopian alternative world, but it’s also served as (and continues to serve as) a catalyst scene of resistance, from Stonewall to Tbilisi. As Joshua Chambers-Letson writes in After the Party: A Manifesto for Queer of Color Life, “The party is as much a site of refuge as it is the site of revolutionary planning.” What do you think nightlife teach us about activism and community-organizing? 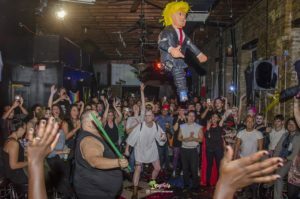 TRQPITECA: As queer and POC nightlife organizers and artists, the core of our aesthetic and operational framework is DIY. This is a commonality shared with activists and community organizers—the understanding that in order to affect change, we must create, build, and do it ourselves. Nobody is doing the work for us, but we know that more can be done, and the burden can lighten if we share the load by working together. We think this is something offered by nightlife—dancing to a hard house or techno track during a DJ’s set, for example, can actually be part of a healing process. Preparing a fabulous look or witnessing someone else’s carefully crafted look can be medicine. As artists, we bare our soul through our art work; when we are supported and witnessed by other people, they can help lighten our loads. As witnesses, engaging in an energetic exchange with an artist, and seeing our existence reflected through their body of work, can in turn lighten our loads, and this can be a life-altering experience. The same things can be said about activism; a community organizer’s impassioned megaphone speech, the sheer magnitude of thousands of bodies moving together for a common purpose at a march, can offer the utter conviction that your existence in that moment is part of a larger purpose. That sense of conviction is what drives queer nightlife—when we say we’re “getting our lives,” we literally are living, and that’s the beauty of our purpose. You’ve situated ICUQTS at the intersection between art, queer culture, and dance music. But also, at the intersection of the diverse communities you are a part of. Do you see hybridity and intersectionality as connected issues? That intersection comes from TRQPITECA more than ICUQTS. ICUQTS wants to integrate issues of health & wellness and economics into the intersection of art and queer communities. ICUQTS wants to create room for conversations about problems that are not being solved in a gallery or nightclub. Intersectionality and hybridity are not necessarily viewed as issues as much as states of being or thinking that allow ample room for multiplicities in identity and practice. “Intersectionality” is an issue if its gets into the wrong hands, those whose purposes ultimately serves the forces of oppression, people who need to check off boxes of identity inclusion in order to secure their own paychecks. Hybridity, fluidity, nonconformity are all cool. The afterparty is usually not the main event, but I imagine the afterparty is crucial to your planning process. How are you envisioning the afterparty in relation to (or extension of) the discourse and art spotlit throughout the weekend? TRQPITECA: For us, the afterparty will be pure and simple in its purpose: to celebrate the kick-off of the symposium, and continue the ICUQTS agenda in a more dance-party-focused way. We are hoping that people will leave the space of the art exhibition at ICUQTS, and enter the realm of experienced sensation through movement, sound, and spiritual connection with others on the dance floor at the party. Though our parties are usually visually opulent expressions of queer and tropical fantasy, this time we want to strip it down to the core of what started TRQPITECA, and that is our love for music; to listen, dance, feel it, and share it. The art will come from the people and the DJs we have booked to spin, which represent a musical and cultural cross-section of queer DJs in Chicago; Nishkosheh, Rae Chardonnay, Morenxxx, Cqqchifruit, La Spacer and Hole Boss will all bring something different to the dance floor. 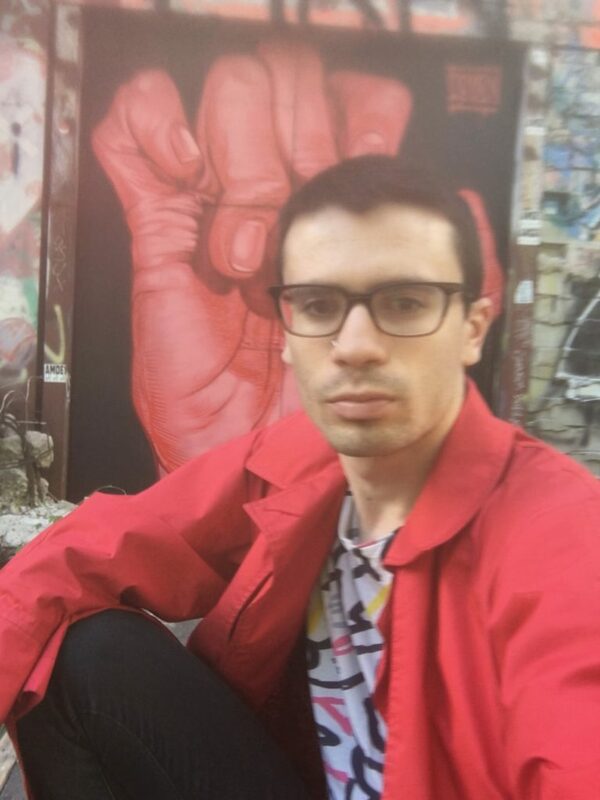 Additionally we are excited to feature a live performance by queer artist and activist Doralyce, who will be coming to Chicago from Pernambuco, Brazil, through research conducted by Julia Guimarães, a PhD student at Northwestern. DJing is musical research in and of itself, and allowing party goers to be introduced to pedagogical research subjects adds a research-based element from the traditional symposium format to our queer, underground version. Can you share more about what you mean by “Underground” (which you also highlight in the symposium title)? How will ICUQTS honor underground queer performance? TRQPITECA: Underground goes back to the TRQPITECA aesthetic and origins of being an underground queer nightlife and art event, created on the foundation of tropical house and techno music. Specifically, house and techno music began as underground cultures created and developed by people of color as well as queer people in Chicago and Detroit. It is important to note that during the creation of these genres, the founders were further outcasted by the mainstream, until the popularity of these genres overpowered the control of musical and cultural gatekeepers. The aesthetics and styles of these subcultures created by these marginalized groups of people led to a global movement that has since been co-opted by the white European majority and turned into a capitalist machine. Similarly, the term “queer” has been co-opted from its origins of resistance and marginalization, into the mainstream capitalist outlets, and the styles and cultural signifiers of queerness have followed suit, while origins of these styles remain in the shadows. The placement of “Underground” next to “Queer” in the acronym ICUQTS signifies that there is a direct relationship between “Underground” culture and “Queer” culture; the overlap exists in the outcast, the freaks, those who refuse to fit inside anyone else’s box, and those whose very existence defies expectations. We want to uplift artists that are defying expectations with their artwork, and even defying expectations of what “queer” or “art” can be. The International Chicago Underground Queer Transcendance Symposium (ICUQTS 2018) will take place September 29-30, 2018 1-9 PM at 2134 South Troy Street, Chicago. Tickets are available at icuqts2018.brownpapertickets.com. 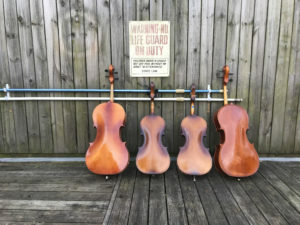 You can find additional information, including the full artist lineup and festival schedule, at icuqts.com. See you on the dance floor!